When it comes to goal setting there are some right ways to do it and also some wrong ways. It’s New Years so we are thinking about resolutions and since just 8% of people actually achieve their New Year’s resolution that method clearly doesn’t work. So how should we set goals and how often? 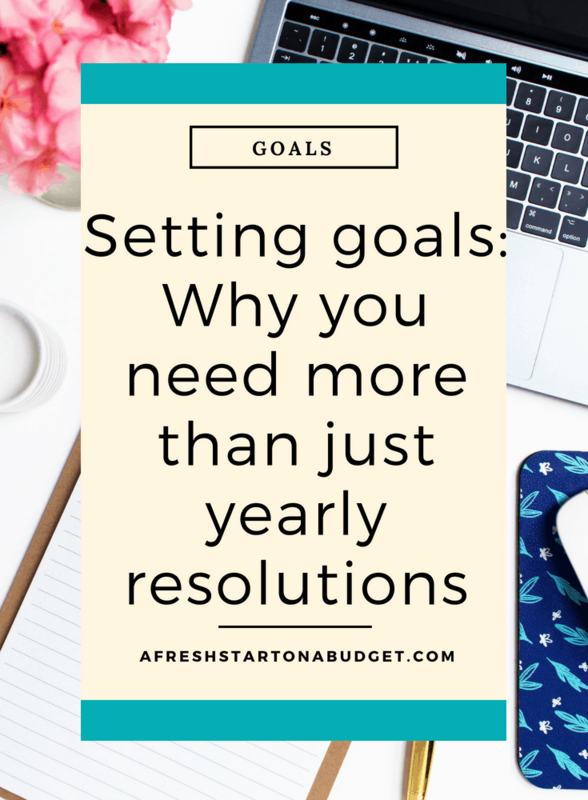 Do we need more than just yearly resolutions? Let me take a guess that you’ve set a New Year’s resolution that you really wanted but didn’t end up actually doing it. Me too! This past year I’ve been learning more about goal setting and how to increase productivity. I’ve gotten much better at meeting my goals and getting things done. Though I hope to continue improving in 2017. Why don’t Yearly goals work? They don’t work because they’re too far away. Your life in January 2018 is so far away from where it is now in January 2017. So much could change in the next year both positively and negatively to effectively plan a successful resolution. There is no sense of urgency to keep pushing you forward. Ever set a goal that you really wanted to do but just not right now. If you set a goal for the year you will keep telling yourself you have plenty of time to achieve it. It becomes too easy to put off till later. They become unimportant. You set them with the best of intentions but you set the wrong type of goals. We will discuss in a post coming up how to set goals that really get accomplished. New Year’s resolutions are not accomplished by 92% of people who set them. So they clearly aren’t the right type of goals. 90-day goals tackled in 30-day increments. This creates fast-approaching deadlines and forces you to set goals that are both challenging and realistic. A fresh plan of action and new goals every 30 days. Remember how motivated you feel each year when you set your resolution …but after a few months (or weeks), you lose interest? Or life changes and your 1-year goals no longer fit? When you set goals each quarter and monthly. You keep your motivation and drive up and can get more done and start accomplishing things more frequently. Find out how to be held accountable – You don’t reach goals just by setting them. You reach goals by pushing yourself to make what you want to accomplish a habit. And that requires accountability…something to keep you focused on the right tasks each day. I still enjoy setting New Year’s Resolutions but I look at them as more of a wish and what I want to accomplish in the next year. I know that to really achieve anything in the next year though I need to set more goals and have more than just yearly resolutions. In an upcoming post, I will share just how I break down my larger goals into smaller goals and set them through the year. I wanted to make sure that you understood why you need more than just yearly resolutions before we took that next step. Here is how to break down big goals into smaller pieces. We don’t make New Year’s resolutions in our home. We do set goals though for each thing we intend to accomplish as they arise. I like to make lists and check off accomplishments! So glad you share with us at Merry Monday. I love new years resolutions but I always set goals for one month to keep motivated! YES! I’m all about this perspective when it comes to setting goals. I wrote a post last year about “why your new year resolutions are going to fail (and how to prevent that from happening)”. I also think that the resolutions you make need to be viewed as a lifestyle change and not just a goal to be reached and then moving on.